Here is the alleged basis for this claim: Ann Curry question to Rouhani on NBC, former President Ahmadinejad said that the Holocaust is a myth, do you agree? “I’m not a historian, I’m a politician,” Rouhani said. And here’s a transcript of Netanyahu’s video statement above. Seems a little competitive when he says he’s meeting with the president next week. And note the absence of any conciliatory statement– though the Israelis always say, All we want is peace! Do they? I appreciate President Obama’s statement that Iran’s conciliatory words will have to be matched by action that is transparent and verifiable. And I look forward to discussing this with the president in Washington next week. Iran thinks that soothing words and token actions will enable it continue on its path to the bomb. Like North Korea before it, Iran will try to remove sanctions by offering cosmetic concessions while preserving its ability to rapidly build a nuclear weapon at a time of its choosing. Israel would welcome a genuine diplomatic solution that truly dismantles Iran’s capacity to develop nuclear weapons, but we will not be fooled by half measures that merely provide a smokescreen for Iran’s continual pursuit of nuclear weapons, and the world should not be fooled, either. Who looks the more reasonable leader, Rouhani or Netanyahu? “I look forward to discussing this with the president in Washington next week.”nuttyahoo. Why does this war monger get so much of obama,s time. Does anyone keep a cost of massaging the occupation,s nations ego.Must be in the billions and I am not referring to the 3 to 4 billion handed over annualy to these criminals. It would interesting to know how much the SOS blows monthly fellating zionist donors, both at home and abroad.Not to mention keeping Israel,s neighbours nice to their boistrous little neighbour. As I recall there was a conversation between Obama and Sarkozy, inadvertently recorded, in which S said he couldn’t stand Netanyahu and Obama replied ‘I have to deal with him every day’ – certainly not ‘I’ve always found him quite a nice guy’. Every day!! It has been and is absolutely clear that Israel does not want peace. They have never stopped trying to acquire more land through what ever means necessary. Wars, theft of land through illegal settlements, refusal to freeze growth of settlements. Israel also continues to refuse to sign the IAEA’s Non Proliferation Treaty which would place their massive stockpiles of nuclear, chemical and biological weapons under international inspections. These massive stockpiles of deadly and un checked weapons have been and continue to be a threat to peace in the middle east. They want recognised, peaceful possession of all the land from river to sea, with the Palestinian population induced – humane and generous means are envisaged, of course – to emigrate, at least up to a point where only a museum-piece remnant is left. And they are so reasonable and everything. And they want to do something kind for the Palestinians and it would be for their own good. Off topic but what do you think about Egypt driving the Brotherhood underground? Do you think they’ll start addressing the hijab issue at some stage ? If all the women are walking around as muhagibaat wouldn’t it lessen the impact of moving away from Islamism in politics? Rouhani was interviewed on CNN, and said not only that he was not a historian (perhaps to shift away questions about details about the holocaust) but also said that the Nazis’ murder of Jews was [bad, atrocity, something like that] and that even though it did occur — NB: no suggestion here that the murder by Nazis of Jews (no mention of all the others also murdered by Nazis) didn’t actually happen ! — that such murders did not justify Jews [depredations, bad acts, something like that] against anyone else (I think he did not say “Palestinians”). Rohuani called the holocaust a crime against humanity. A clear, succinct, just and moral comment. 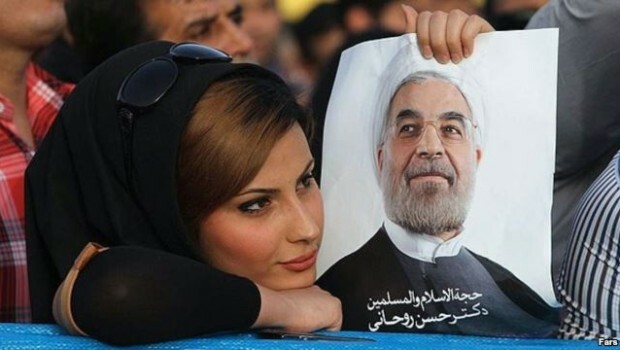 Zio-supremacists won’t know what to do with it…well, other than slag it and Rouhani. Ayatollah Khamenei, the highest authority in the land has said on more than one occasion that their religion does not permit them to build a nuclear bomb. But this is not good enough for Israel. CNN is not a serious news organization. They regularly fabricate news instead of reporting news. Anyone remembering Avaaz Syria Danny on CNN? Your links show Rohuani did condemn both what the Nazis did to Jews and non-Jews, and what Israel has been doing to the innocent Palestinians (without specifically naming Israel). He said the world should not ignore either. Philip you should Thank me too, even though I spoil your party. CNN Fabricates Iranian President’s Remarks about Holocaust. TEHRAN (FNA)- The Cable News Network (CNN) had better learn trustworthy coverage from its peer NBC, specially when interviewing a country’s president. Yes, of course, Rouhani did not deny the crime and he also condemned it. But other than CNN claimed Rouhani did not name the crime “Holocaust” and he did not give this crime some kind of singularity. It’s very much in line with a third world view that Europeans committed many crimes, from starting horrific wars including WWI and WWII, practicing slavery and colonialisation, committing genocides in Africa, genocide against native cultures in America to christianize them, burning people alive and feeding them to dogs and many more, some of them – like the ethnic cleansing of Palestine – lasting to the present time. So the conclusion is the European or “western” culture is just very violent and it’s history full of many ugly crimes. From that point of view the Nazi crime against the jews is just one more crime committed by Europeans. A crime committed by Europeans against Europeans, in the frame of a war started by Europeans, a world war under which many people in the world suffered, including the Iranians. So Rouhani didn’t assign the Nazi crime against the jews “singularity” and thereby he infuriates the zionists who try to build a kind of “holocaust religion” from the Nazi crime against the jews. And did the Israelis ever condemn the Mongol invasion of Persia? I appreciate President Obama’s statement that Israel’s conciliatory words will have to be matched by action that is transparent and verifiable. And I look forward to discussing this with the president in Washington next week. Israel thinks that soothing words and token actions will enable it continue on its path to full apartheid oppression of the Palestinian people. Like South Africa before it, Israel will try to remove sanctions by offering cosmetic concessions while preserving its ability to rapidly build expand the illegal settlements in the occupied West Bank at a time of its choosing. The world would welcome a genuine diplomatic solution that truly dismantles Israel’s capacity to continue to develop illegal settlements, but we will not be fooled by half measures that merely provide a smokescreen for Israel’s continual pursuit of apartheid oppression and denial of human rights of the Palestinian people, and the world should not be fooled, either. How about: BOMB…BOMB…BOMB…IRAN (repeat obsessively ad nauseum)? End of “How to recognize a madman when you see him” quiz. Whatever one thinks about Israel, good or bad, Iran should not be allowed to get nuclear weapons. Iran should be allowed to get nuclear weapons so long as the world refuses to act to disarm every other state of its nuclear weapons, especially israel. (I would prefer every state be free of such weapons.) No one who is not willing to disarm israel has any basis to prevent Iran from protecting itself. >> Whatever one thinks about Israel, good or bad, Iran should not be allowed to get nuclear weapons. Whatever one thinks about Iran, good or bad, Israel should not be permitted to have nuclear – or other – weapons of mass destruction. Don’t, we may end up getting the whole hasbara script. @Mike – – I think chances are ZERO that Obama would let Iran build nukes. Ever dawn on you that they are using centrifuges to enrich their uranium? And that the output is a gas? You can’t make a nuclear weapon out of a gas, and Netanyahu knows this. Nuclear weapons are made of of metal uranium. […] The gaseous diffusion process used to enrich uranium requires uranium in the form of UF6. In the first step of UF6 production, uranium ore is mined and sent to a mill where uranium oxide (often called “yellowcake”) is produced. The uranium oxide is then sent to a UF6 production facility. At the production facility, the uranium oxide is combined with anhydrous HF and fluorine gas in a series of chemical reactions to form the chemical compound UF6. The product UF6 is placed into steel cylinders and shipped as a solid to a gaseous diffusion plant for enrichment. Or, read a longer article about this by a retired Oak Ridge Lab nuclear expert who was in charge of creating nuclear material for the US Govt. Uranium hexafluoride isn’t the final state. It is only used in the enrichment process to increase the percentage of fissionable material. It is then converted to metal. Whether they have the capability of completing the process from uranium hexaflouride to finished munition is another story. Apart from Israeli propaganda, what makes you think Iran wants nuclear weapons? Nobody attacked Israel’s nuke bomb centers, yet Israel bombed both Iraq’s and Syria’s, and now wants to bomb Iran’s nuclear plants even though Iran is legally allowed to make them for civilian purposes and is subject to international monitoring, while Israel is not. I don’t get it. I especially don’t get why the US totally ignores this state of affairs. Given Israel’s conduct in this, why wouldn’t every other country in the Middle East rationally want nukes to defend itself against threats from Israel, who already has said record? Israel also has a general history of aggressive warfare labeled “defensive” and/or “preemptory” or “preventive” to avoid international law in this area. Every war Hitler initiated against another country he characterized as “defensive.” even Operation Barabarossa against Russia, which he had a peace pact with. Note how America treats its whistleblowers: Snowden’s old wine in new bottles. Netanyahu’s a liar. Rouhani did no such thing. Why is it appropriate to ask the Iranian leader if six million Jews were killed in world war II at the hands of the Nazis? Why is it relevant what Phil Weiss old pen pal Gilad Atzmon thinks about holocaust denial? or David Duke? I could give a flying duck. biorabi, more importantly, why does he have to believe it? It’s more important to find out how he will be treating the 30,000 Jews that chose to remain in Iran than about his feelings about a sad and wicked historical WW II event. The refusal to emigrate to Israel by the Iranian Jews in spite of the generous bribes offered is a big slap in its face. It’s really satisfying when people end up showing their true colors; it confirms what you suspected all along. It’s such a relief knowing you can rely on your intuition! I agree by the way! It’s not appropriate to ask Iranians whose friends and relatives were gased and slaughtered by America’s fair-weathered friend Saddam such a question, as if Iranians need to guess the pity-party password to get some respect. It would be much more polite to say: “We’re sorry we helped Saddam slaughter and gas so many of your people and we’re sorry we inflicted years of suffering on your people by replacing your elected President with the Shah. We really fvked up!”, instead of endlessly playing the ol’ Zionist victim card with them making them feel guilty for supporting the oppressed people you Zionists are scr..wing big time, just because y’all feel owed other people’s land. It’s true though that sometimes, the best way to defend yourself is to play along, and give in to the little charade while you prepare for that inevitable day when your opponent tries to scr…you and when you have the wealth of resources Iran has, that day will surely come. Zionists should keep one thing in mind: not everyone’s their fool. Quite why anyone should accept or believe the words of a delusional hyperbolist, with past form of wild exaggeration, lies and ridiculous smears is beyond me. The self-aggrandisment and colossal sense of self-importance that Nety never ceases to display is far, far worse than Iranian leader has ever shown. A country which makes stupid, fake videos, builds childish demonising websites and feeds the media a barrage of misinformation excepts to be listened to seriously? Yahoo, you are out of your mind. MY COMMENT: This appears to be yet another instance of ‘psychological projection’ on the part Netantahu! Israel’s nuclear program had its inception with the establishment of the state in 1948. Profoundly influenced by the horrors of the Holocaust, Ernst David Bergmann, “father” of the Israeli bomb program, and David Ben-Gurion began a program to develop nuclear weapons because, in the words of Bergmann, “The State of Israel needs a defense research program of its own, so that we shall never again be as lambs led to the slaughter.” In 1952, the Israeli Atomic Energy Commission was established, and the Israeli bomb project initiated. Despite Israel’s assurances to Washington that Dimona was a peaceful research facility, extreme security measures—including shooting down one of its own Mirage fighters, and a civilian Libyan airline, killing 104 civilians—told a far different story. Dimona went online in 1964 and plutonium production began shortly thereafter. By 1966 Israel had built its first nuclear weapon, and by the 1967 war two nuclear weapons were ready for use. During the 1973 war, Israel possessed several dozen nuclear weapons and threatened to use them in order to coerce the U.S. into providing a massive airlift of weapons. Although Israel maintained—and still maintains—a position of “nuclear ambiguity,” neither acknowledging or denying its nuclear arsenal, the Israeli “bomb in the basement” was now an open secret. . . Even as it backed down in the Sinai [following its invasion in 1956], Israel was involved in another monumental deception, a plan for building its own nuclear arsenal. Bravo. Bibi Netanyahu is a shameless liar. Full stop. For 8 years the world had to endure the Presidency of GWB and his henchmen/women. I felt ashamed for the US, and very disheartened by the gullible citizens who elected that cabal, not once but twice (sorta). The resultant “WOT”, deliberate campaign for fervent Islamophobia, and no effort toward peace of any kind had begun in earnest. What Israelis keep doing by electing & empowering this warmonger and dangerous nutball liar is as bad, if not worse. Netanyahu “Israel would welcome a genuine diplomatic solution” Step right up and sign the IAEA’s NPT and open up your gates to real international inspections of your massive stockpiles of nuclear,biological and chemical weapons that every nation in the middle east lives in the shadows of. Netanyahu has no idea what “genuine diplomatic solutions” are. Yep. First they should announce that they actually lie and admit that they have lied and tell the world that they have N/B/C weapons– lots of them! I am sick of their and our hypocrisy. It’s time that Israel admits that they are actually worse than NK….. whose people are still starving. He’s a liar. He’s not capable of ever speaking the truth. He cannot be diplomatic– he wants no peace. He wants hegemony, and for the Palestinians to be gone by whatever means necessary. He wants to be the ruler of the ME, and anyone who stands in his way will be squashed. He’s dangerous, and our complicity makes him even more so. My hope is that his messianic ‘dream’ never becomes a reality. Fat chance! Those “massive stockpiles of nuclear,biological and chemical weapons” will come in real handy should the Palestinians gain some miraculous advantage. Then they’ll go from being oppressed people to guinea pigs. Now you know those Zionists won’t sit on all those WMDs without trying some out, don’t you? I mean they don’t even view Palestinians as human anyway. I’d say Israel uses the negotiations as a smokescreen ‘on its path to total annexation’. 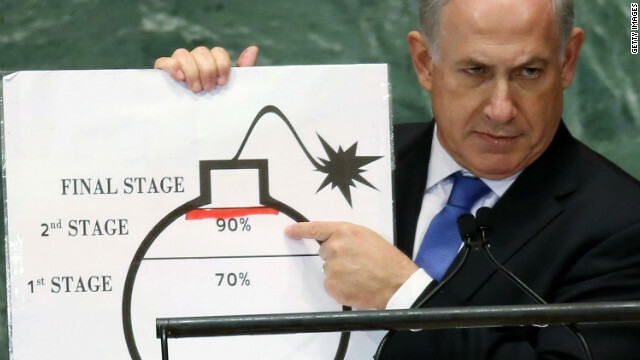 Netanyahu reminds me of Wile E. Coyote. >> Netanyahu reminds me of Wile E. Coyote. He reminds me of Napoleon from “Animal Farm”. Bravo, Eljay. Netanyahu is a shameless and dangerous liar. regarding Allowing Insult to Islam and Holocaust Denial. Many have been tried for questioning the Holocaust, but maybe the most appalling trial pertained to Late Prof. Roger Garaudy whose trial resembled that of Galileo. If the western states believe in Positivism which calls religion and metaphysics areas beyond science which must be kept away, then why the Jewish Holocaust is viewed like a religious taboo which cannot go under any questioning or study by anyone and should always be taken for granted?